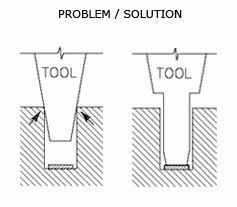 Deweyl Tool offers custom bonding tools solutions to address the problems of today's complex package designs. 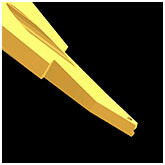 For example, the A1 option shown offers a clearance cut on either side of the tool. The following diagrams demonstrate the various problem situations that can occur during bonding operations, with suggested solutions. Please refer to the accompanying PDF document for detailed measurement specifications. Additionally, please reference these options as A1-A10 or A12-A14 when ordering or seeking assistance. These option numbers will appear as the last item in the part number. Rollover image thumbnails for a larger view. Refer to the accompanying PDF document for detailed measurement specifications.